During 2016 there was an unprecedented arrival of rarities in Britain and Roy Harvey was fortunate in being able to capture many of them on video. 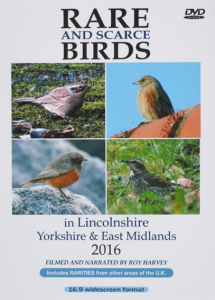 Lincolnshire attracted some excellent birds throughout the year including the county's second-ever record of Alpine Accentor at Gibraltar Point. The same reserve also hosted 2 Caspian Terns in June, and a Red-flanked Bluetail in the autumn. In August the arrival of a Western Purple Swamphen at Alkborough Flats created a huge amount of interest and in the same month a very showy Squacco Heron finally revealed itself at Barton Pits. Earlier in the summer a Great Reed Warbler was at nearby Waters' Edge. Frampton Marsh again won the award for the most wader species seen on an RSPB reserve in 2016, including Black-winged Stilt, 2 Broad-billed Sandpipers, White-rumped Sandpiper & Long-billed Dowitcher all of which captured on video. Another Red-flanked Bluetail was at Donna Nook, as were 2 Siberian Stonechats. 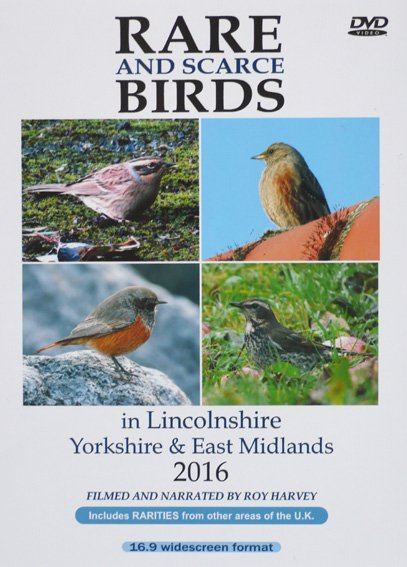 Neighbouring Yorkshire did exceptionally well for rarities with the Siberian Accentor at Easington being the bird of the year for many people. Remarkably, it was sighted just a few yards from where an Olive-backed Pipit had been found a few days earlier. An Isabelline Wheatear and a Siberian Stonechat also turned up at Easington. The Kentish Plover arrived at Kilnsea just in time for the Spurn Migration Festival and a Brown Shrike was the first to be recorded in the Spurn area. At RSPB Bempton Cliffs an Eastern Crowned Warbler was a cracking find, as was the elusive Paddyfield Warbler at Flamborough. The Hume's Warbler and the Hoopoe at the same location were particularly obliging. Filey attracted a Surf Scoter and later in the year, a very photogenic White-rumped Sandpiper. Further west, a Spotted Crake at North Cave Wetlands attracted a steady stream of admirers. Inland, Hatfield Moors hosted some nice waders including Baird's Sandpiper and Buff-breasted Sandpiper. As usual, some cracking birds from outside the featured region were also captured on video. The Great Knot at RSPB Titchwell Marsh was extremely popular, and both Isabelline Wheatear and Desert Wheatear arrived at Burnham Overy dunes. A little further to the south the Western Purple Swamphen was filmed at RSPB Minsmere - the site where it was first located. The north-east of England also featured very strongly with Eastern Black Redstart at Skinningrove, Isabelline Shrike at South Shields and a Pied Wheatear at Redcar. Even further to the north was the Brunnich's Guillemot in Anstruther harbour. In the south of the country a Least Sandpiper at Seaton Wetlands showed superbly and we also connected with the long-staying Hudsonian Whimbrel & Dalmation Pelican in Cornwall. Good birds turned up away from the coast, not least of all the lovely adult male Kentish Plover at Audenshore Reservoirs in June. A Sabine's Gull at Carr Vale in Derbyshire was an unexpected arrival, but the Dusky Thrush at Beeley was even more surprising! Once again the DVD includes a summary of the best of the October birds on the Scillies, including the first record of Caspian Tern for the islands. To be on the safe side we finished off 2016 with the Blue Rock Thrush in Gloucestershire, but realise that the discussions regarding its origin might go on for some time. All of the above birds, and more, are included in the two-disc DVD set which has a total running time of 218 minutes. The usual narration provides information for each sighting.